Buying equipment for a new business is an important, yet often stressful part of getting ready to launch. Investing hard-earned capital into fixed assets before you even make your first sale can be a nail-biting experience for even the most confident entrepreneur. To make the right purchases, it’s essential to comparison shop and carefully assess the long-term value of each piece of equipment. Before you head out the door to start shopping, it’s absolutely essential to first create a list of your equipment needs and wants. This list should be part of your business plan and something you continue to update and revise as your business grows. The list should be broken into two columns. The first includes a rundown of the essential pieces of equipment that you must have now for basic operations. The second is a “wish list” of items that could help your business but aren’t mandatory. Start by shopping for everything on your must-have list before investing in the extras that you can get once your business is up and rolling. While it can be very convenient to have a postal franking machine in your office to stamp all of your outgoing correspondence to customers, could you save money by simply taking your mail to the post office? As part of your list of needs and wants, you’ll want to identify what makes sense to outsource for financial reasons and space limitations. You may be able to get by without the industrial coffee bean grinder, copier or other cumbersome piece of equipment in the near term to cut down on your initial capital investment and to avoid cluttering your workspace. Whether you have a salon, restaurant, office or retail business, you need to have accurate measurements of your workspace to help you make smart choices when it comes to what you’ll be buying. That photocopier with all the bells and whistles might seem like a fantastic deal in the office supply store. However, if it’s too big for your office, it’s no bargain! Carefully measure each area where equipment will be placed and note the ideal dimensions you’ll need. A space planning tool like SmartDraw can be particularly beneficial by enabling you to digitally design your space and drag and draw furniture and fixtures that you need. 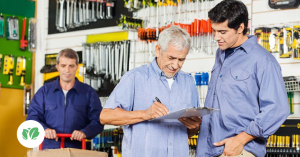 Having this plan in hand when you start your equipment shopping can help you narrow down your choices and prevent costly mistakes. Keep in mind that you can expect to find savings of at least 25 to 50 percent on used equipment. Often, you can snap up higher quality items than you expected to purchase when you venture away from new equipment dealers and start searching for bargains on used items. Don’t be afraid to go to auctions, liquidation sales, garage sales and online sites to find deals. It can be a great way to slash those initial capital expenditures that can take a significant bite out of your first year’s profits. Of course, a seemingly good deal on a piece of equipment is no deal at all if it frequently breaks down or doesn’t serve your operational needs. While price is important in deciding what to purchase, the greater focus should be on quality and value. When it comes to buying equipment for your business, “caveat emptor!” Let the buyer beware. If you find an incredible deal on something you need, take the time to research the model online. Often, you can find reviews on sites like ConsumerReports.org or even retailer sites where customers can provide feedback. By carefully checking out an item before you buy it, you can save yourself a lot of potential headaches down the road. Additional considerations? You will want to factor in whether or not there is a local provider who can work on the equipment if it needs service or repair. Also, find out if parts are locally available or if they’re being shipped from across the country or overseas. When you’re looking to save on equipment, it’s easy to just go for the lowest price model. In some cases, this strategy works. However, there are those critical items that are worth spending a little extra on to avoid many potential problems. For those in the restaurant industry, knives, ranges and pots and pans need to be able to produce quality food while withstanding heavy use. Hair salons require top-notch client chairs, lighting and cutting tools. Offices that rely heavily on computers should stick to well-established brands and avoid lesser quality PCs, printers and monitors. And, you deserve to have a high-quality office chair that supports you when you’re tackling the administrative and marketing tasks that will require you to sit at a desk. If you’re like most new business owners, you probably don’t have enough in the bank to cover the cost of all of your equipment needs. Yes, there are small business loans available, but typically, these are not given to new businesses that have yet to establish a track record of success. Credit cards are another option for paying for equipment, but it’s important to consider the interest rate and how long you’ll take to pay back the amount owed. Another option is applying for a business line of credit with Kabbage. The application process is simple, and approval is given in minutes instead of weeks. With lines of credit up to $150,000, you can obtain the capital to purchase equipment, and there isn’t any obligation until you take the cash.